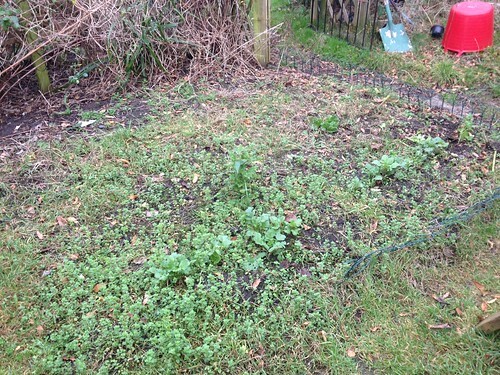 Ever since I have been growing veg in my garden, I have been plagued with weeds. 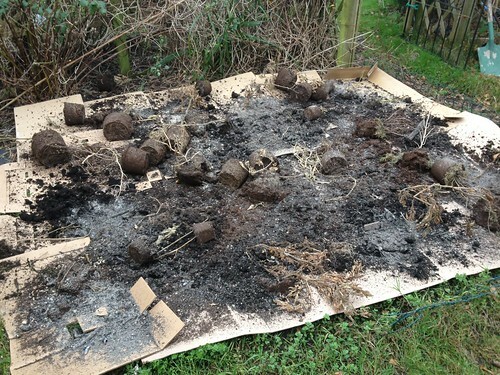 Apparently the previous owners of our property bought some cheap compost from gypsy doorstep sellers and it was riddled with everything under the sun. Every year, I sow my seeds and hope for an abundant crop, but every year, the weeds grow. First the ground elder, then the chickweed, red Shanks and clover and finally the worst of them all, the horsetails. It’s heartbreaking seeing your carefully tilled soil being taken over mercilessly by weeds. However, not all is lost (I hope), I have recently discovered a method of growing veg called the lasagna garden or layer garden method and it has got me excited and despare has once again turned to hope. A lasagna garden is made up of layers, much like the lasagne you eat. The ground can be tilled soil, lawn or any piece of land really just as long as it is free draining and chemical free. Layer one is placed directly onto the ground and is comprised of a high carbon medium like paper or straw. 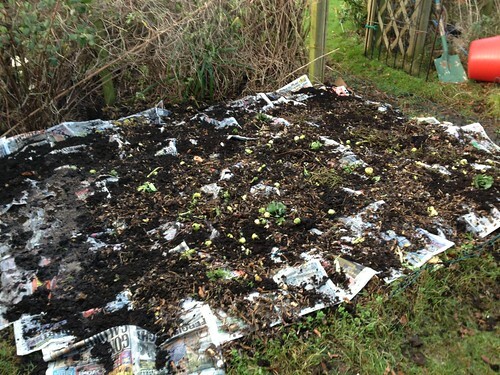 This provides a growing medium and a way of smothering weeds which may grow in the soil underneath and provides a wonderful environment for worms and other good insects. Layer two is a high nutrient layer which can be made up of rotted compost, manure or even green, unrotted cuttings and kitchen scraps. Layer three is another carbon layer, four, another high nutrient layer and so on until you have something a foot or two in height. 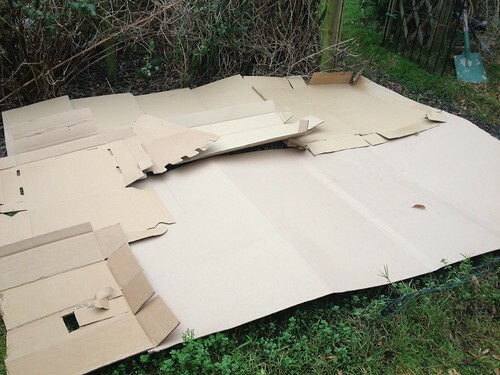 Firstly, I covered the ground in a layer of cardboard. These were free from my father’s workplace but there’s always plenty for free at supermarkets and DIY stores. After a quick watering, I added layer two. 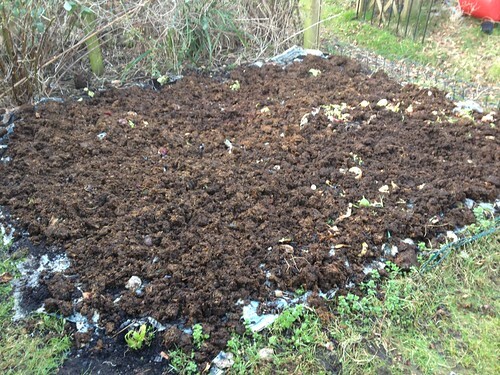 This was comprised of some compost from some late tomatoes I had planted and never came to much before the first frosts. 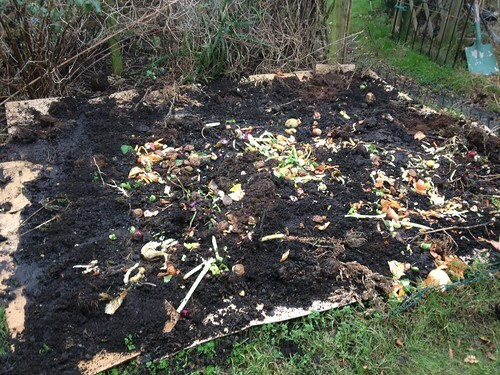 I also added a scattering of potash from the bonfire and some kitchen scraps. Another watering and one went the next layer, some newspaper about half a newspaper in thickness. 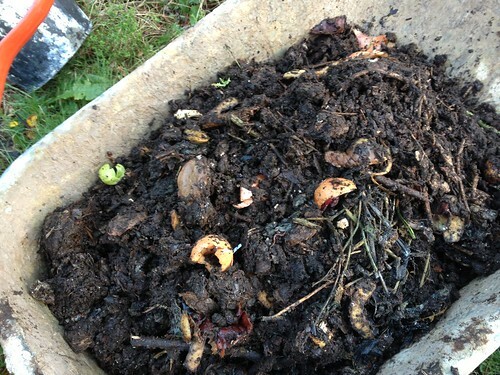 Next, I added some half rotted compost from my compost maker. 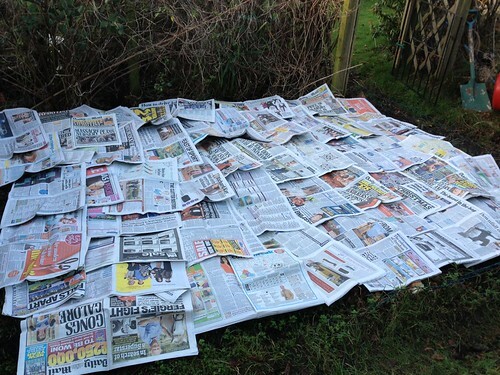 After another layer of newspaper, more kitchen scraps, six bags of rotted horse manure and three months to settle in, I think it’s finally ready! I’ve never done this before so it’s a total guess what the outcome may be but I enjoyed creating the lasagna garden over winter and have my fingers crossed for the coming year. I have my doubts as I do wonder if all the fresh nutrients are the right thing to give young plants and I do fear slugs might love living between the layers but it’s certainly worth a shot.